The Fumetti in Treviso association announces the 5th International Contest for New Authors, which will be held as part of the Treviso Comic Book Festival 2016. The theme of the contest is “PUNK!” and the works must be stories that are in any way related to the punk movement, which celebrates its 40th anniversary this year and as such will be an integral part of the theme inspiring the next TCBF. 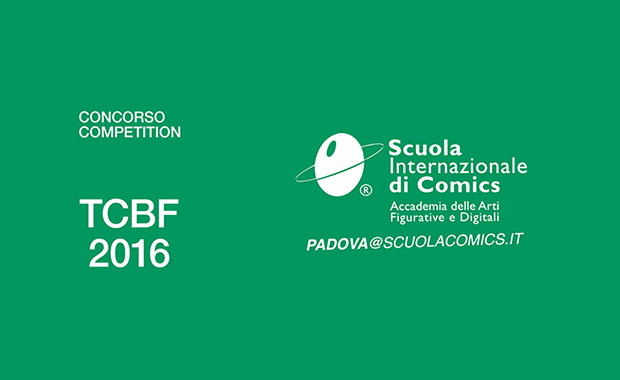 The awards are offered by the Padova International School of Comics and consist of: 500 Euro for the first place; 300 Euro for the second place; 200 Euro for the third place. The contest is aimed at all new cartoonists aged 18 and over worldwide. By “new cartoonists” the organizers mean non-professional authors, who are not in any way employed in the illustration field and have not published work at a national and international level. Students specializing in comics and authors collaborating with fanzines or self-productions will be admitted. The candidate/s must present a comic story composed of a minimum of 2 to a maximum of 4 drawings or plates related to PUNK, the theme of the event. The maximum format for each drawing is A3 (29,7×42 cm). The drawings can be created with all kinds of hand-drawn techniques and can be in black and white as well as in color. Digital coloring and digital lettering is also admitted, but all submissions must include the original drawings/tables.